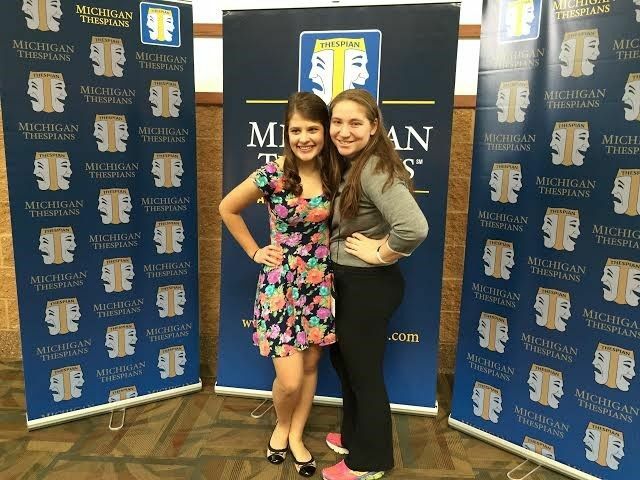 Two Marian students, Senior Anne Koziara and Junior Katie Schulz, came back to school with top honors after competing at the Michigan Thespian Festival at Saginaw Valley State University, December 4-5. Over 1,900 students participated in the festival which featured workshops and plays in addition to the competition. Anne won the Thespian of the Year Award, one of 10 high school students to receive this top honor. Anne, the daughter of Michele and David Koziara of Farmington Hills, received superior ratings in the individual events of Musical Theatre and Acting. She won a $500 scholarship to the college of her choice in addition to a $45,000 scholarship to Rochester College. The students saw three plays and participated in six workshops taught by college professors from all over Michigan. The workshops included topics such as acting, singing, dancing, improvisation, character development, make-up techniques, set design, stage management, and stage combat. Besides competing in Performing Arts and receiving written evaluations from the judges, Anne and Katie also visited many of the college exhibitors who were present. Marian High School, an IHM sponsored school, is fully accredited by NCA CASI, an accrediting division of AdvancED. Marian is a Catholic college preparatory school for young women, sponsored by the Sisters, Servants of the Immaculate Heart of Mary. The mission of Marian is to ensure, within a Christian environment, an excellent education built on a strong academic curriculum, which will enable young women to value human diversity and live responsible lives of leadership and action based on gospel values. An enduring tradition: guiding young women spiritually, challenging them academically, and inspiring them to a life of leadership and service.